Ventless Gas Fireplace with Fire Glass Colors. Stainless and Black burners with colored vent-free glass. 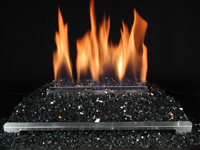 Ventless Gas Log Fireplaces Glass Fire Colors in Stainless and Black. 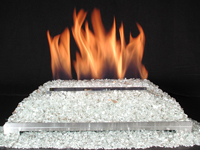 Glass Fire Alternative for Ventless Gas Log Fireplaces. 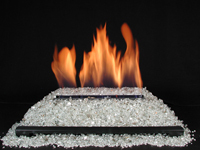 These Alternative Glass fire ventless fireplaces are a New Design that has never been available before. 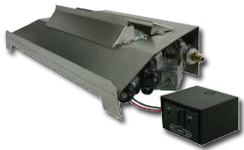 Stainless and Black vent free gas burners with crushed colored fire glass or even without highly reflective fire glass. 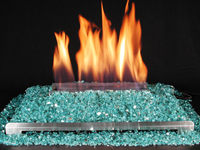 Fire glass is available in dozens of colors and textures for vented and ventless gas fireplaces. These vent-free gas fireplace burners and controls with remote controls and varuable remotes are available with safety pilot oxygen depletion sensors for safe indoor use with or wothout a chimney or ventilation. 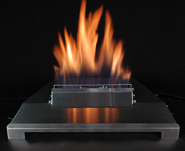 The ventless fireplace allows a larger viewing area for your fireplace by recessing the valve inside the burner. A traditional fireplace burner needs 12" or more to allow for a valve. For the Modern or contemporary home where traditional gas logs would be out of place the glass fireplace alternative is a beautiful fire effect that will safely heat your home. 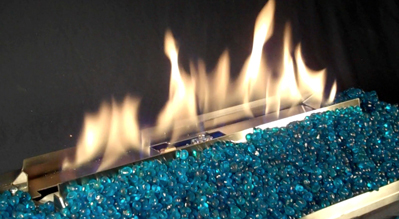 Buy Blue Fire Glass Fireplace. Buy Green Fire Glass Fireplace. Buy Copper Fire Glass Fireplace. Buy White Fire Glass Fireplace. Buy Black Fire Glass Fireplace. 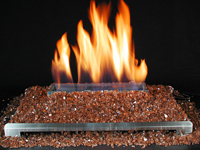 Currently Rassmussen is the Only gas log manufacturer in the world providing vent-free glass fireplaces. Vent-free ALTERNA sets are for use in wood-burning fireplaces or approved vent-free firebox enclosures. Glass doors must be open when burning for proper ventilation, proper combustion and cooling of safety control valves. With adequate combustion and ventilation air the damper may be closed for vent-free use. The damper may be opened slightly for reduced venting. Check local codes and ordinances for permitted uses. 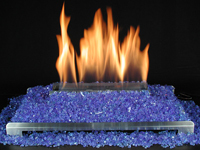 Only recently, alternative fire shapes and crushed glass fireplaces have become liscensed for ventless fireplaces. All ALTERNA Ventless burners feature state-of-the-art lanced port, opposed louver aspirated burners for clean, efficient burning and proven performance with glass, embers and coals. They're Safe! Ventless gas log glass fireplace burners are available with a variety of valves including, manual, wall mount, thermostatic, variable flame remote and wall timers for operating the flame. 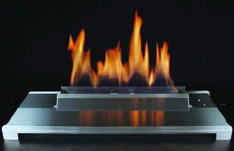 Ventless glass fires are also available in two-sided, double face fireplaces.